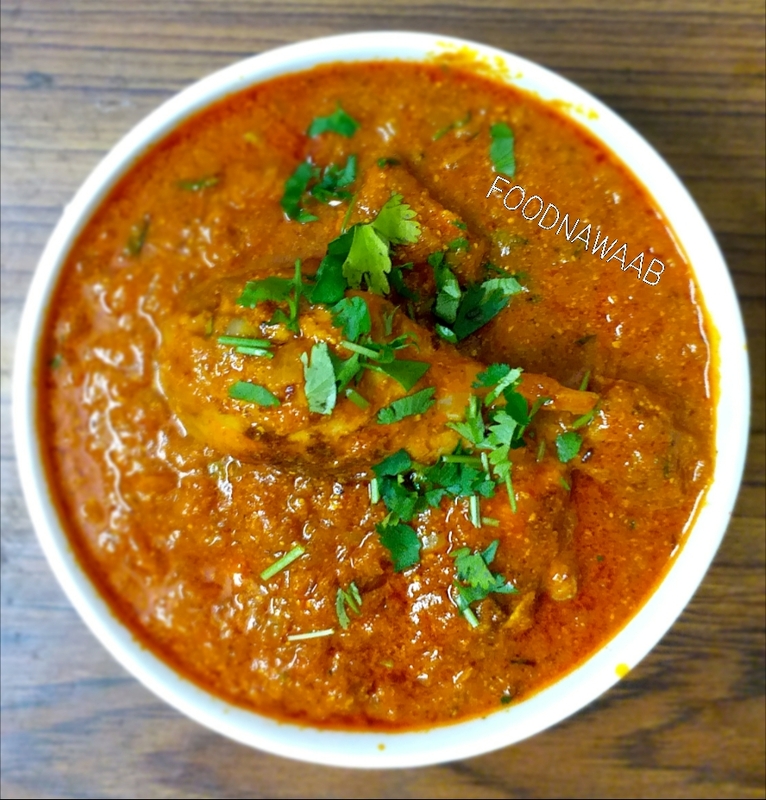 Marinated Chicken cooked in Curd based gravy along with Indian Spices. Take a Bowl and mix mustard oil, Red Chili powder, 1 spoon ginger garlic paste, turmeric and salt, make a nice mix of marinade make sure everything should be balanced. Drop in the Chicken and then let it rest for at least one hour. Take a large Skillet and drop in the mustard oil on medium to high flame, once the oil is smoking hot then drop in the whole spices and wait till they crackle. Then add the onions and sauté until golden brown, turn the flame to low. Let the onions get a little brown then add ginger garlic paste and mix well. After 5 mins add the tomatoes and powdered spices and add half cup water. Cook well on medium flame until the tomatoes are cooked and tender. Now remove the pan from the flame and let it rest for 5-7mins. Add the dahi (curd) spoon by spoon and gradually mix in the gravy. Once the curd is added then add another half cup of water and let it cook for 10mins on medium flame. Take off the pan and grind it to make smooth runny gravy. Take another pan, drop in the mustard oil and swirl it, once the pan is smoking hot drop in your chicken and turn every 15 secs. Once the chicken is chaared and browned take off the pan and let it rest. Drop in your gravy and after 5 mins drop in your chicken and cook for 10 mins. Garnish with fresh coriander and serve with Indian Breads. Let’s Drool Over Kebabs and Qormas!